Homeric Poems offers a distinctive combination of artistic elements, modern equipment, exclusive services, luxury and comfort. Here, it is for sure that you will enjoy an exceptional vacation filled with inspiration, relaxation and unforgettable moments. Built on the cliff at a privileged location, in Firostefani village, it offers accommodation and services of high standards for guests that seek for luxury. Nineteen large light apartments and Suites open on to sky-high views of the volcanic Caldera island and are painted in shades of blue, blue-grey and white. Materials are predominantly wood and stone, and colorful island textiles, used for rugs curtains and bed coverings, soften the look. Each apartment of Homeric Poems is different from its neighbor, and each is a showcase for the proprietor’s eclectic collection of antiques and found objects. Also Private pool and large marble Jacuzzi in Grand Suites, Jacuzzi tubs in Honeymoon and Superior Suites. The apartments, each one named after a Homeric character are tastefully decorated with antiques and hand made furniture. They have all the facilities found in a small house. Bedroom area with built in double beds and large living room area with sofas, dining table and small kitchenette. The bathrooms decorated in blue mosaic tiles have showers and all the accessories found in a Deluxe Hotel. The biggest highlight of these apartments is the unique view you can enjoy from the large furnished private terraces. The perfect choice for families, groups, or for those who desire a more luxurious abode, this striking sea captain's cottage has been converted and renovated to house three Suites under one roof, accommodating up to twelve guests in total. Inside each Suite you'll walk on gorgeous white marble floors and admire hand-picked artwork and antiques from the owner of Homeric Poems' own private collection. The luxury continues in the marble surfaced bathrooms, where you'll find your own Hydromassage bathtub to lay back and relax in. Most attractive of all is the private terrace which each Suite leads on to. Created from stone and representing impressive traditional workmanship, it features intricate nautical designs and occupies a hallowed position offering unsurpassed views over the caldera. This gorgeous spot is furnished with sun beds and is for the exclusive use of guests staying in the Sea Captain's House Suites. Named Achilles and Eros, the Honeymoon Suites are blessed with magnificent views of the caldera basin and the sparkling Aegean, and their seclusion makes them ideal for couples who want to enjoy each others company and forget about the world around them. Eros is filled with traditional furnishings, a huge, soft bed and an intimate balcony. Lazing in your bed will never be the same again, as you can drink in the amazing view through the vast window without leaving it! In Achilles the cast iron framed Queen sized bed dominates the bedroom, while the Hydromassage bathtub does the same in the marble bathroom. Here, your view is from your bed, the pretty balcony opening from it or from the comfort of the living room sofa. 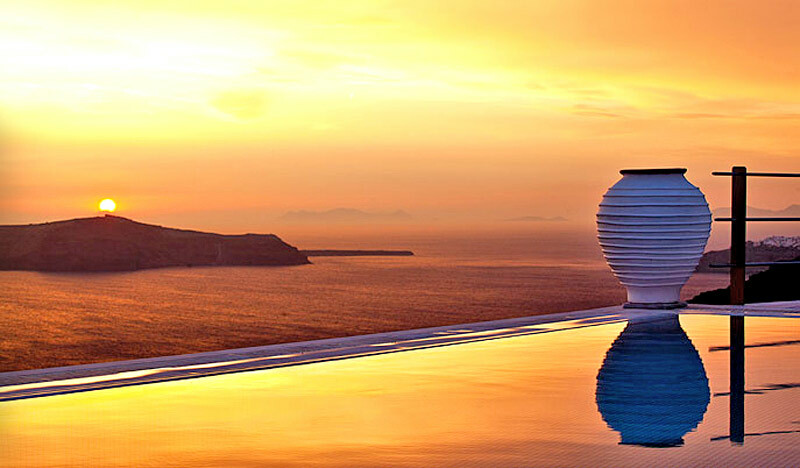 In our continuous pursuit of excellence and having luxury, comfort and spectacular views as our primary goals, Homeric Poems has created 3 Grand Suites completed in May 2005. Each suite occupies an area of approximately 100 sq m with spacious terraces and large private pools. The interior consists of large living room area equipped with B/O sound and visual system, dinning area all complimented with numerous large windows offering breathtaking views of the Aegean, Volcanic islands and during the afternoon the sunset which sets in front of the suites. The bedroom that leads to the private terrace has a king size bed and an en suite with a large marble jacuzzi lit with optical fibres giving the ceiling a look of a night sky filled with stars. The spacious bathroom also offers views and all the amentities that are expected in a Grand Suite. All Grand Suites offer a private pool and Jacuzzi. The colours, the furniture, the light fixtures give each suite a unique feeling of warmth, romance and luxury creating an idyllic environment for a stay that will surely become a life time experience. -Breakfast and return private transfers are included only in Grand suites rates. -Children up to 6 years old are free of charge including baby cot.